12 classic scenes as you’ve never seen them before! Everyone’s favorite bespectacled explorer has been many places — the land of dragon flyers, a Jurassic arena of sports-loving dinosaurs, the set of black-and-white movies in Hollywood. Join Waldo as he handpicks his favorite journeys of all time, revisiting twelve of his most fantastic travels in a new format that includes a surprise at the end of the book. Eye-boggling games await Waldo-watchers alongside every scene in this fresh tribute to Waldo’s many years wandering the world. 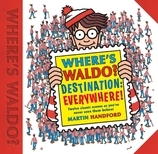 32 / 11 13/16" x 11 3/8"
Martin Handford is the creator of Waldo. He began his career as a freelance illustrator specializing in drawing crowd scenes — and the rest is history. He lives in England.